Laptops today, and especially gaming laptops, often come with multiple GPUs on the system. In most cases, you will have a discrete card such as an NVIDIA Geforce 1080, and then an onboard graphics processor from Intel. The idea being that you only use the high end card from NVIDIA when you need it. There are many benefits to this setup. For one, it uses less power. That means that you will have better battery life on your machine as high end video cards can chew through power like candy. It also means that your machine runs quieter and cooler. High end cards found on gaming laptops under $1500 and higher run hot requiring fans that generate a lot of noise to keep it from overheating. But, if they only run when you need it, that means a quieter experience, and one that won’t burn up your lap in the process. 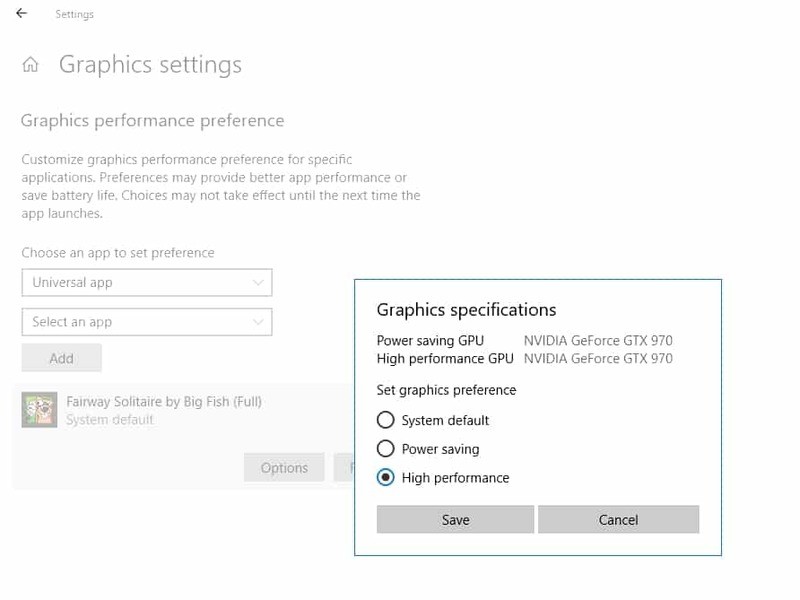 In theory, Windows will automatically switch between the cards when needed, but you can customize this experience by selecting which GPU a game or app uses in Windows 10. 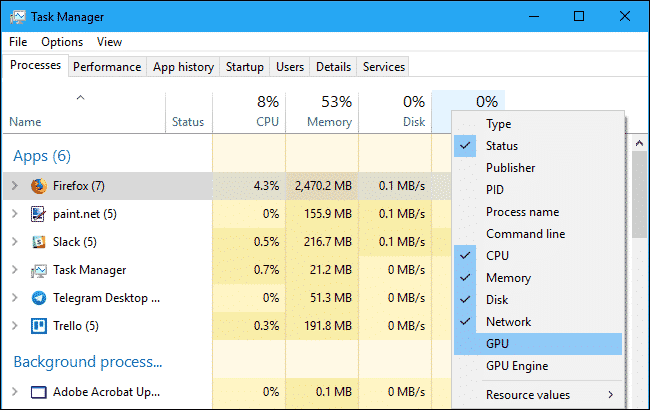 It’s actually quite easy to set which GPU a game or app uses on Windows 10. In order to configure these settings, you will need to make sure your app or game is installed and running and you will need multiple video cards in your laptop. You also need the Windows 10 April 2018 update installed on your system to have the settings. 1. Click on Start and then click the Cog icon to go to Settings. 2. Go to System > Display. 3. Click on the Graphics Properties link. 4. Select the app you wish to customize. For a new Windows 10 app, select Universal App. For regular apps, such as games, select the Classic App choice. 5. Click the Browse button, and go find the exe file for the game you wish to change. 6. Select the Options button. 7. From here, you can select the different options available to you. For example, if you have a single card, you will only see it in the list for all the available options. However, if you have multiple GPU cards, the better card will be set for the High Performance choice. From here, you can choose which card will be used by the game or app when you launch it. 8. Click Save after you have made your changes. If the application or game is running, it may need to be restarted for the changes to take effect. After you click save, close any windows that may be open. That’s all you have to do and you have now customized which piece of hardware your app or game will use for video. 1. Run the app you wish to check. 2. Right-click on your taskbar and select Task Manager. 3. Find your app or game in the list. 4. Right-click on the columns and make sure GPU Engine is selected. Once this is done, you should easily be able to see which GPU engine is being used for your game or app. If it’s not running the correct GPU, first try restarting the app. If that doesn’t do the trick, double check your settings by following the guide above to make sure you have all the settings correct. Now you may be wondering why you should even bother customizing these settings. After all, Windows 10 is supposed to be smart enough to automatically switch between the cards when it’s needed. Right? While that’s true, there are still reasons why you want to go ahead and set these ahead of time. 1. Improved Performance. 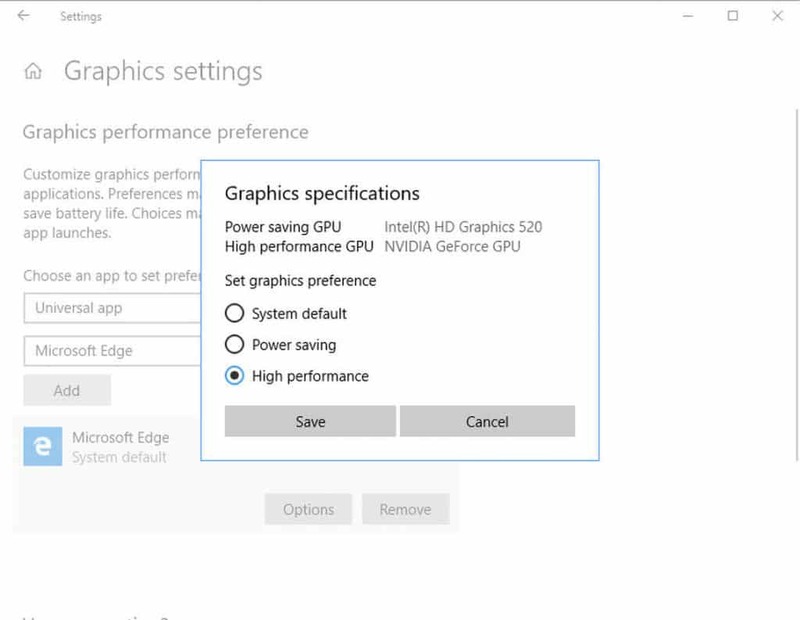 By settings the GPU, you don’t have to worry about Windows using the slower card until it’s necessary. The end result is improved graphic performance in your app or game all the time, not just when it is necessary. 2. Load Balance. This is even more true if you make use of the card for certain apps like Photoshop, while keeping lower end apps like your web browser running on your slower card. This will balance the video load on your machine and only use what’s necessary for each app. 3. Better Customization. There’s nothing quite like complete control over your computer. Having these settings gives you even more control over what hardware each of your apps and games use. Now you can finally tell your machine what you want each to use, so resources only get taken in a way that you want, not in a way that your system determines for you. Microsoft continues to add more and more features designed to help gamers customize their experience and improve their gaming performance on their laptop. In their latest update, they added this handy new feature that allows you to customize which video card each app or game uses. This will give you more control over your system and your hardware that will give you even better performance while you use your favorite apps and games. Have you given this setting a try yet? If so, did you find that it improved your performance in any way or did it just give you a little more control over your laptop? Tell me about your experience in the comments below.